Joe Bee Xiong was born in 1961 in the rural village of Xiengkhoung, Laos. He grew up there, and his family made their living by raising garden crops and hunting. This was a common occupation for Hmong people. When Joe Bee was fifteen-years old, he learned how to play a unique musical instrument. The name of the instrument is spelled qeej in the Hmong system of writing, but the word sounds like “gheng” in English. Many members of Joe Bee’s family could play the qeej. At first, his grandfather, Teng Xiong, taught him how to play the qeej. Later his father, Chay Xiong, taught him more. Then Joe Bee learned a great deal from his older cousin Nhia Yang Xiong, the best qeej player in Xiengkhoung. Joe Bee learned quickly. By the next year, he and Nhia Yang were honored to be the only two qeej players invited to perform at an important gathering in Pakhia, Laos. Why did Joe Bee move to America? Hmong people originally lived in China. 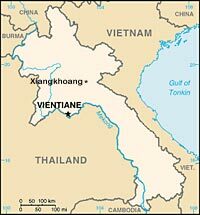 They moved to different parts of Indochina in the 19th century. During the War in Indochina in the mid-20th century, Hmong soldiers fought in Laos in the "Secret War." This was guerrilla-style fighting between communist forces from North Vietnam and forces from Thailand, Laos and the United States. The Secret War ended in 1975 when the Pathet Lao took over Laos. Like many other Hmong, Joe Bee and his family left Laos because they feared for their lives. They escaped to Thailand by walking through the jungle and crossing the Mekong River. It was a long and very dangerous trip. They lived in a refugee camp in Thailand for several years. By the beginning of the 1980s, Joe Bee came as a refugee to the United States, to live in Eau Claire, Wisconsin. Joe Bee learned English quickly. He spoke to groups in Eau Claire who wanted to learn more about Hmong people and culture. He wore traditional Hmong clothing at these talks, and brought the qeej and other Hmong musical instruments to perform. 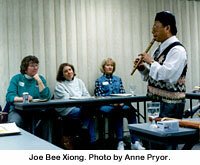 Joe Bee did these types of presentation for nearly 20 years and had become a spokesperson for the Hmong community of Eau Claire. Joe Bee had also been an elected official in Eau Claire. He served two terms on the Eau Claire City Council, from 1996-2000. Joe Bee made history by being the first Hmong person in the United States to be elected to city government!